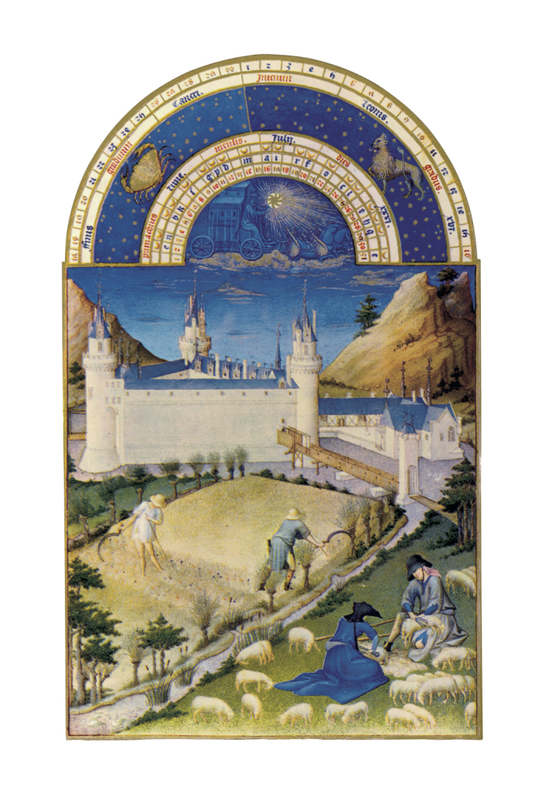 The Très Riches Heures du Duc de Berry is the most famous and possibly the best surviving example of French Gothic manuscript illumination, showing the late International Gothic phase of the style. 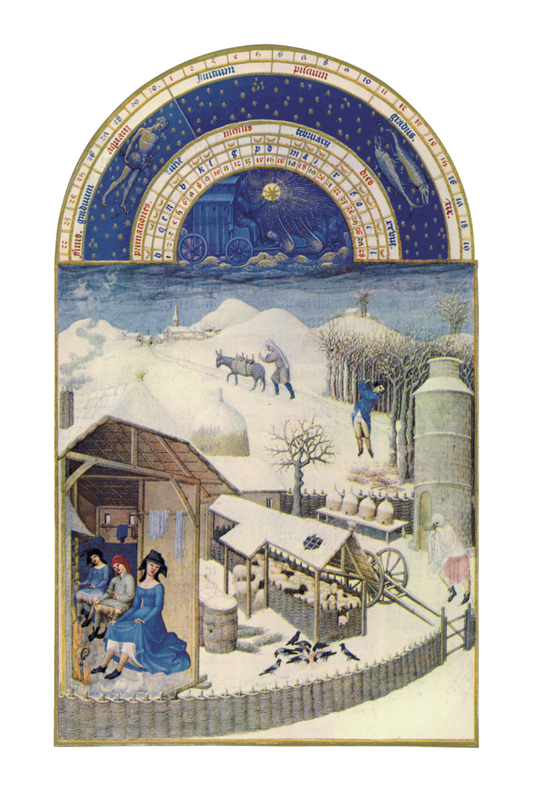 It is a book of hours: a collection of prayers to be said at the canonical hours. 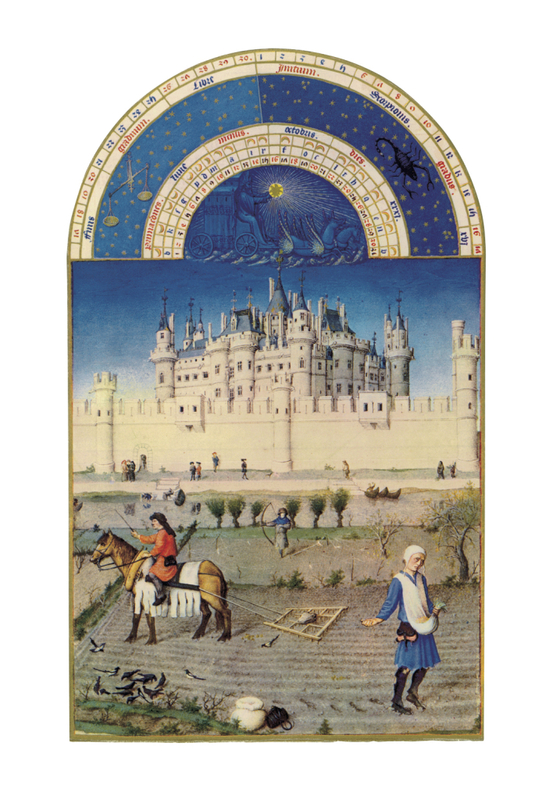 It was created between c. 1412 and 1416 for the extravagant royal bibliophile and patron John, Duke of Berry, by the Limbourg brothers. When the three painters and their sponsor died in 1416, possibly victims of plague, the manuscript was left unfinished. 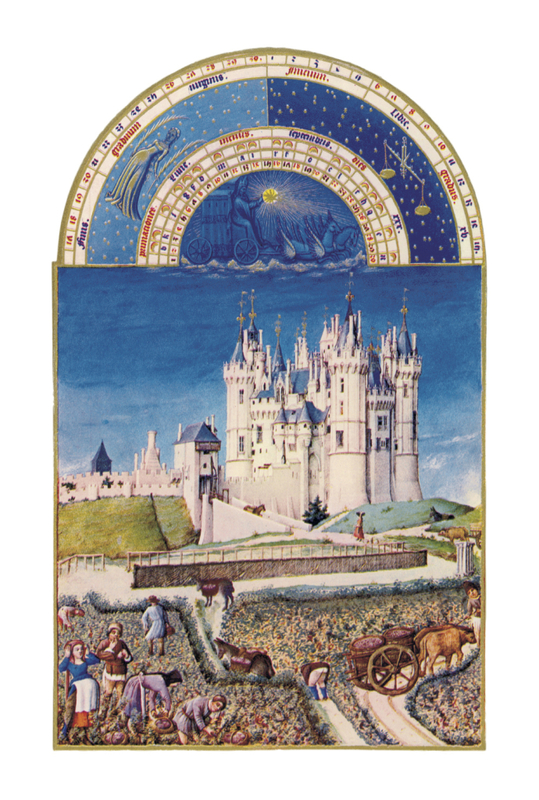 It was further embellished in the 1440s by an anonymous painter, who many art historians believe was Barthélemy d’Eyck. 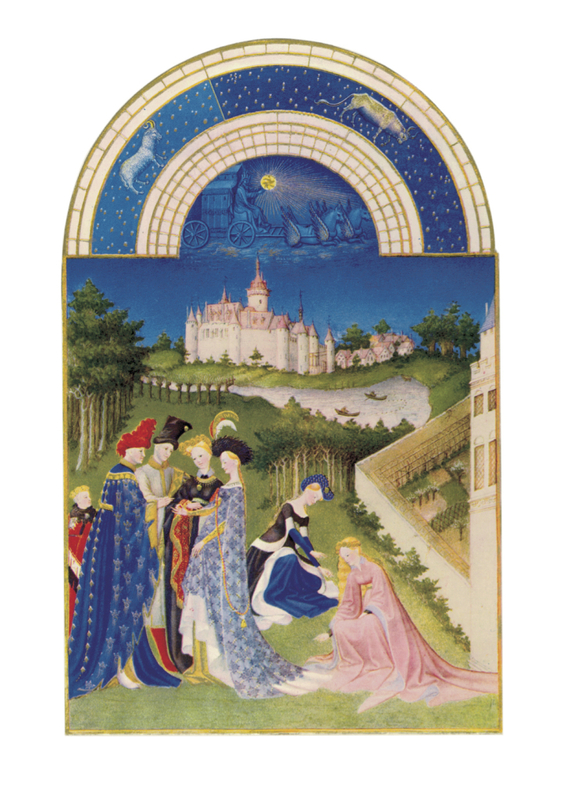 In 1485–1489, it was brought to its present state by the painter Jean Colombe on behalf of the Duke of Savoy. 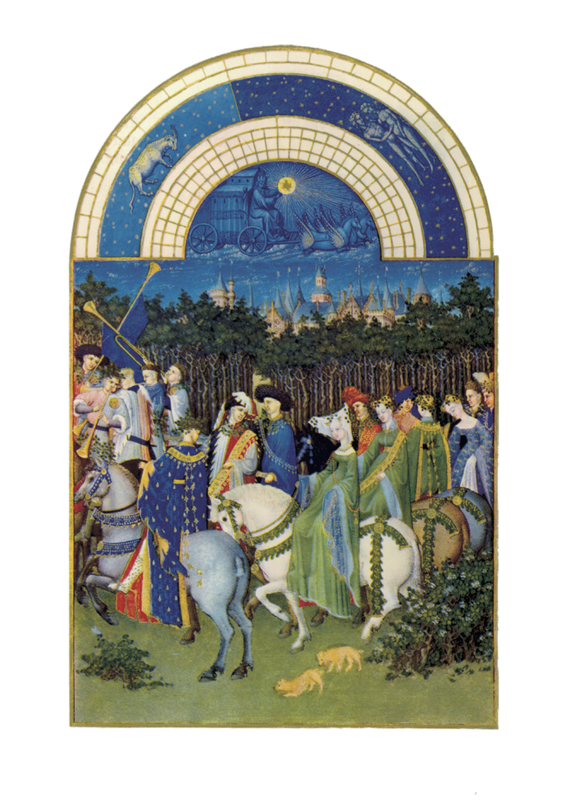 Acquired by the Duc d’Aumale in 1856, the book is now MS 65 in the Musée Condé, Chantilly, France. 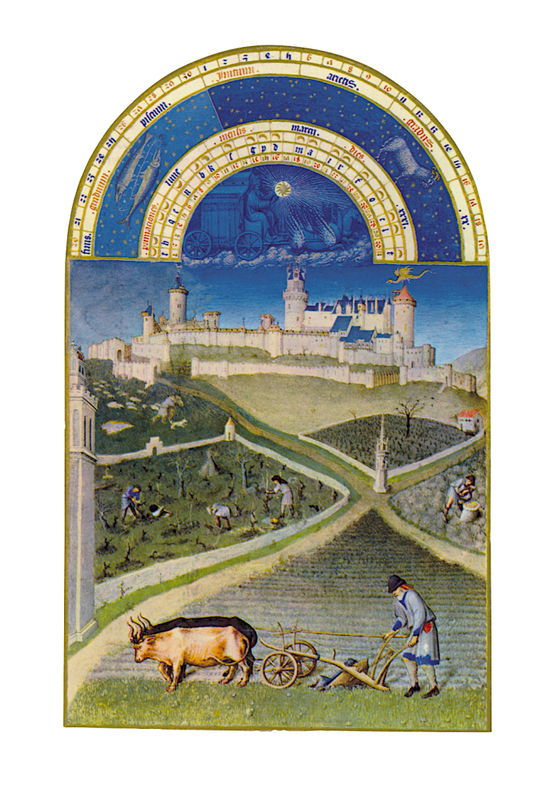 Consisting of a total of 206 leaves of very fine quality parchment, 30 cm in height by 21.5 cm in width, the manuscript contains 66 large miniatures and 65 small. 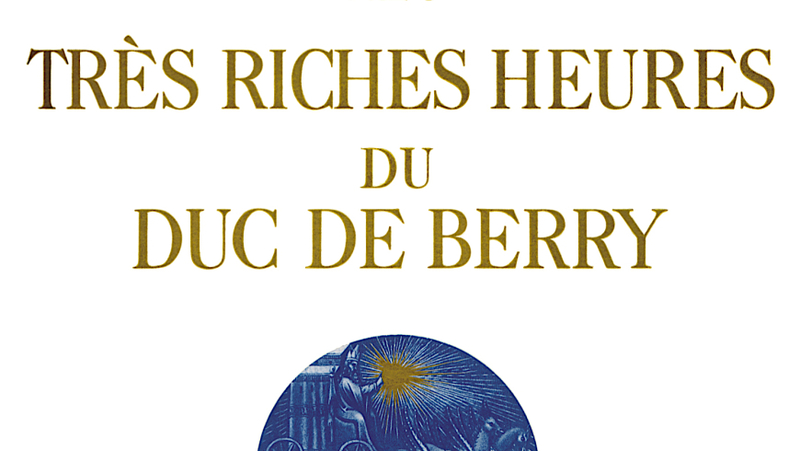 The design of the book, which is long and complex, has undergone many changes and reversals. 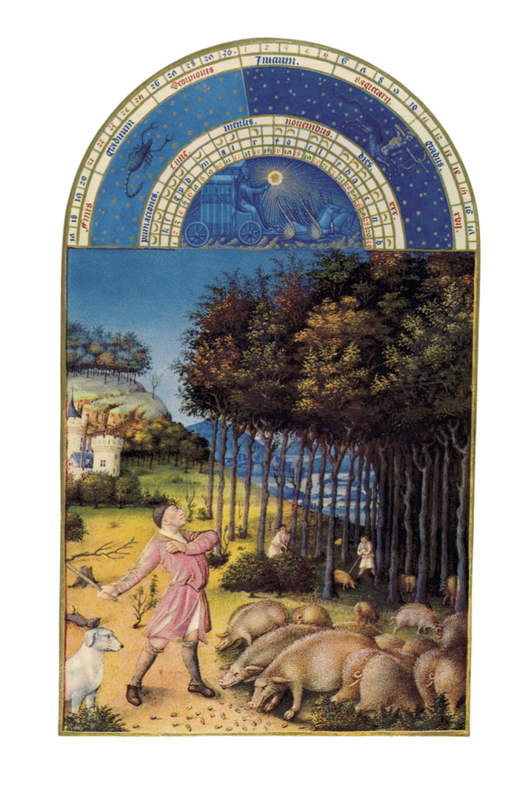 Many artists contributed to its miniatures, calligraphy, initials, and marginal decorations, but determining their precise number and identity remains a matter of debate. 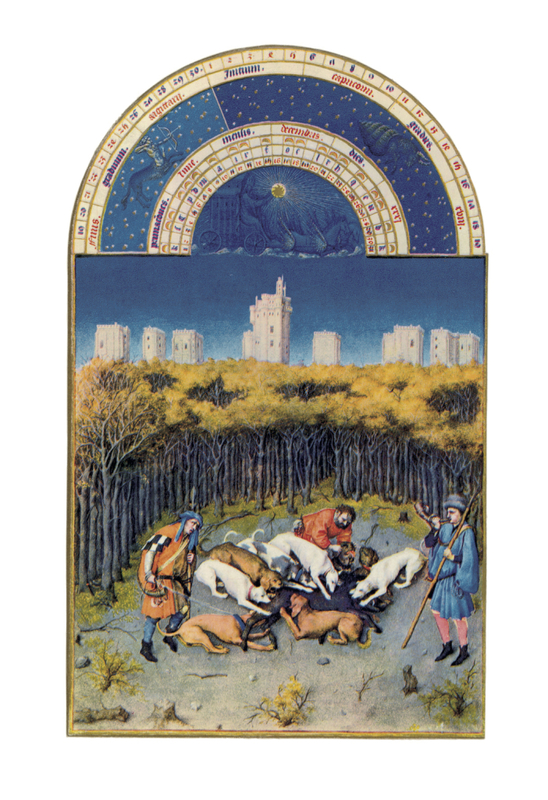 Painted largely by artists from the Low Countries, often using rare and costly pigments and gold, and with an unusually large number of illustrations, the book is one of the most lavish late medieval illuminated manuscripts. 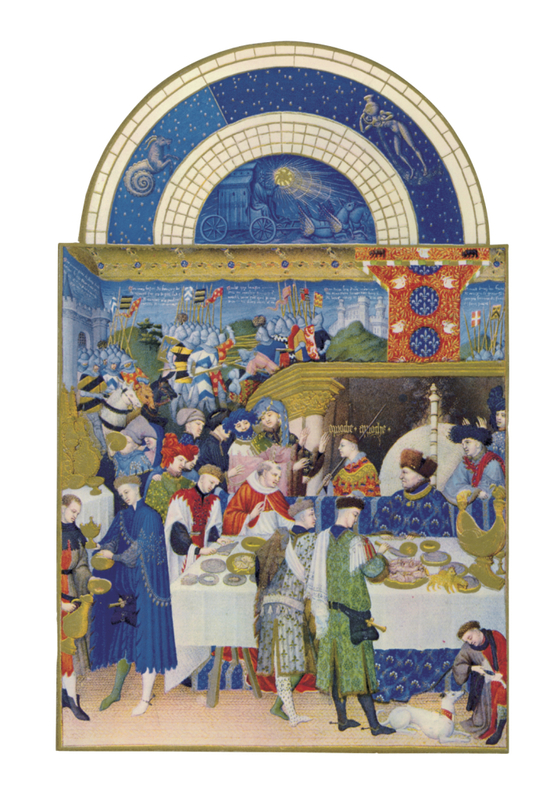 After three centuries in obscurity, the Très Riches Heures gained wide recognition in the late nineteenth and twentieth centuries, despite having only very limited public exposure at the Musée Condé. 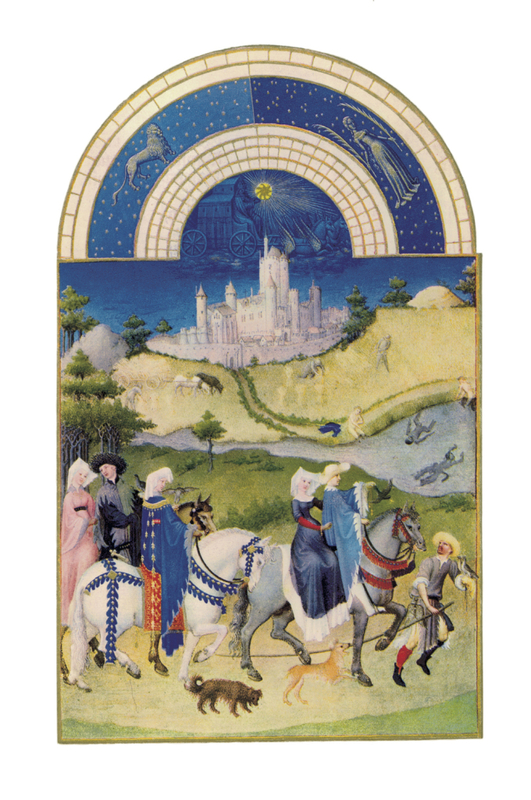 Its miniatures helped to shape an ideal image of the Middle Ages in the collective imagination, often being interpreted to serve political and nationalist agendas. This is particularly true for the calendar images, which are the most commonly reproduced. 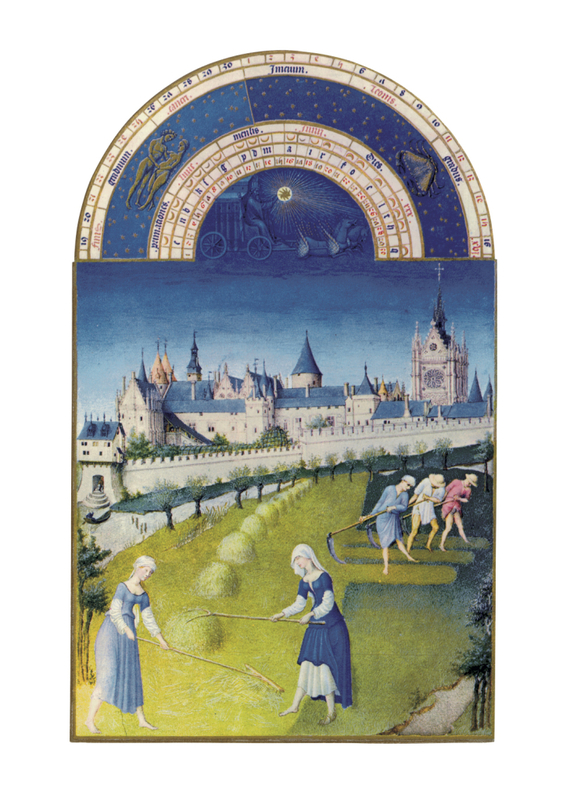 They offer vivid representations of peasants performing agricultural work as well as aristocrats in formal attire, against a background of remarkable medieval architecture. This what Wikipedia reports on the corresponding entry. It is only to be added that the images that appear below are from Verve, the legendary quarterly magazine (1937-1960) founded and directed by Teriade, who in the issue n° 7, that came out in the middle of the war in 1940, offered its readers an excellent, for the time, reproduction of the calendar. The first widely disseminated. “Now, finally, the calendar belongs to the public,” Teriade wrote in the editorial. In December 2009, exactly 70 years later, when I directed “my” Verve (2004/2010), I re-proposed these extraordinary twelve illustrated months, which I am sure will be appreciated now also in the version for BARNUM.